A while back, I made a post about Team GB during the Olympics and how their ethos can be applied to copywriting and conversion rate optimisation. In fact, I’ve just realised whilst typing this that I made that post this exact same day last year – August the 16th. Now that’s spooky! Anyway, that post basically discussed how Team GB, specifically in cycling, have become so successful. They achieved this by making many small improvements, even down to the smallest of increments, and then combining them all together to have a dramatic improvement on performance. Now this is all well and good if you can apply this to your business personally. However, this can be difficult for business owners to do as they often become numb and desensitised to the little things. They’ve spent so long in the same environment and with the same products or services that the smaller points get lost in a sea of more pertinent concerns. Hiring a copywriter or conversion optimisation expert means that we can look at your business from a fresh perspective. Those smaller points you may no longer notice after years in the trade become much more vivid to us, and as a result, it becomes far easier to apply the proven Team GB ethos when increasing sales. What sort of smaller details do we notice? And on their own, they aren’t. Make just one of these tweaks and you’re unlikely to notice any meaningful increase in sales. However, if you make hundreds of small improvements and then combine them together, you could see a dramatic increase in sales which is permanent and doesn’t involve any additional spending on advertising or marketing. I’ve helped businesses make thousands of pounds of extra sales per month by doing this, and in some cases, I’ve even made their marketing more efficient, so they’re earning MORE and spending LESS. If you don’t feel like hiring a copywriter or conversion rate optimisation expert, just spend a few hours going over your website and marketing to pick up on the little things you may have glossed over previously. You never know, you might suddenly spot one or two tweaks you can make to bump up your sales. Even if you only make a little bit extra per month, it’s still a fantastic investment of that time. Here’s a fantastic video I’d like to share called “The User is drunk”. It’s a video about interface design from an Australian company called Squareweave. Pretty self explanatory. Keep the copy simple, easy to understand and straightforward. Never assume that visitors know anything about your product or service prior to reading your copy, or if you do, make sure you’re right about it. When you work with your product or service for many years, a simple piece of information which is common knowledge to you may be fresh news to your prospects. It’s very, very easy for someone to miss a key piece of information by accidentally skimming past it or failing to absorb it properly during reading. The speed sign analogy used in the video is a good one. Repeat key selling points multiple times to really drill them into the prospect’s mind and fortify the emotional urges created by them. Always be wary that visitors may get bored. However, this does NOT mean that you have to make your copy shorter, as this can dull down or remove key selling points and make the overall piece of copy less effective at selling. Instead, use headlines and sub-headlines to keep the reader hooked. This approach can help you write copy which is easier to read and more effective at selling. However, this does not mean that your visitors are stupid, and you should NEVER treat them that way. This means no lying, no misleading, no over-simplifying and no patronising. Keep it honest, keep it simple and keep it direct, but remember that your prospects are – like all of us – smart folk who won’t buy something without a good reason. Copywriting is made up of literally hundreds of little techniques and strategies which all accumulate together to dictate how well a piece of copy convinces prospects to buy something. Whilst many of these techniques are there to squeeze out those last few conversion rate drops, there are some fundamental methods which set the main foundation for good copywriting. The concept of using features and benefits is one of them. They sure sound interesting, but what do they really mean? That’s where benefits come in. Benefits take the features and explain what the results of these features will be. It gives them selling power and it helps the prospect understand what the features really mean. This is where selling really comes into play, as prospects are no longer being sold features, they’re being sold results. They’re being given a sneak peek at exactly what they’re going to experience for their money on a sensory and emotional level. Features and benefits on their own sure do help when it comes to selling, but when combined, they produce a selling force which is stronger than the sum of its individual parts. This is because of two reasons. Firstly, benefits are primarily responsible for results-based selling. After all, when someone buys a product or service, they don’t really want it for the product or service itself. They want it because of the results it will bring. People want to buy a better car for a more improved image and better drive. People want to buy a meal in a restaurant because of the delicious flavours and enjoyment of eating. And yes, people want to buy better speakers so they can have better quality music. Explaining benefits fulfils this vital aspect of selling. On the flip side, features add some tangible substance to these selling points. They fulfil the logical decision making process. Buyers are curious, and they want to know how things work to fortify the selling points within their own minds. The benefits sound great, and prospects want to believe you, but they need to hear or see some substance behind such claims. It’s only natural. Prospects learn that the product or service provides the results they’re looking for, and the features back up the claims you’re making. They then have an emotional urge to buy the product and also have the technical information to make a logically informed decision. By combining both of these, selling becomes much easier to achieve. Whilst copywriting is extremely complicated, keep this fundamental strategy in mind at the very least and you will certainly stay on the right path when it comes to writing effective copy. So much copy to write, so little time! Copywriting for my clients will always come first, so I have quite a few unfinished blogs hiding in the depths of my computer which I’ll hopefully share with you all over the coming weeks. They’re some real doozys, if I do say so myself. However, until then, I’d like to share this great article from KISSmetrics about lessons learnt from eye tracking and heat maps, which is the study of exactly how subjects look at a given page and which visual elements draw their attention in order of priority. It plays a big role in optimum sales conversion rates, which is why I offer free formatting and layout guidance with all copywriting projects. Anyway, take a look and see if you can spot any ideas which you could use to improve your website or landing page. Negative marketing is the act of using your marketing efforts promote your competitors’ negative attributes instead of promoting your own positive attributes. This doesn’t necessarily have to involve marketing entirely focused on putting down your competitors. Even negatively mentioning your competitors within a broader marketing campaign can be construed as negative marketing. Is it effective? It certainly can be IF it’s done properly. However, if you get negative marketing wrong, then it can put prospects off your own business, damage your reputation and even result in legal troubles. The success of negative marketing is heavily based on copywriting, as it’s the way you get across the negative marketing within your text which makes all the difference. So here’s my top tips on what you should and shouldn’t do when it comes to using this risky yet powerful technique properly. If you’re going to make claims about competitors, stick to rigid facts and double check them to make sure that you can’t be accused of making false or misleading statements. This can not only backfire on you, but also result in legal threats due to libellous statements. Also try to avoid subjective comments. Using negative marketing angles based purely on your opinion can be dangerous. As soon as you mention a competitor’s name and make comments directly about them, you expose yourself to a high risk of legal action due to inaccurate or misleading statements. Plus, this sort of tactic can backfire on you if it comes across as a targeted attack. Prospects gravitate towards professional businesses which take the high ground instead of those which get wrapped up in emotions and come across as spiteful or petty. Remember that you can indirectly compare yourself with a competitor without directly mentioning who they are. This is a tactic a lot of businesses use when they don’t feel confident enough to directly mention their name. Plus, by mentioning your competitors’ brands, you’re still promoting their name. Any publicity is good publicity, as some might say! Using spiteful, petty or hateful tones or statements can have a two-fold effect. Firstly, it actually improves the position of your competitor as your target audience sympathises with them, especially if they respond to it in a mature manner or simply ignore it entirely. Secondly, it can severely damage your reputation as your business can be perceived as dislikeable and difficult to work with. Keep it sensitive and respectful. If you make a claim about something your competitors are doing, your target audience needs to agree! There is nothing quite worse than making a negative claim about your competitors’ actions, only for your target audience to turn around and say “well, no actually, I don’t find that an issue at all”. If you’re going to make a claim based on a presumption about your target audience thinks, then make sure it’s definitely accurate. Failing to do this would not only make you look like you don’t understand your customers, but it could also highlight a feature of your competitors’ products or services and turn your negative marketing efforts into positive marketing about them! If you’re going to make claims about prices, products or services, then it can be worth using disclaimers to give yourself a degree of protection. For example, it can be worth mentioning that your facts and figures were correct at the time of publishing, as competitors could change their prices after your marketing has been published and then accuse you of misleading marketing claims. However, remember that this is far from watertight and provides limited protection. If you’re in doubt about anything you want to say in your marketing, then consult a legal expert in the field. Just like myself, all good sales copywriters should have a working knowledge of the latest advertising and competition laws to make sure that any copy produced is safe to use. Negative marketing is for the benefit of the customer. It should be used to highlight factual points, allow comparisons and help your target audience make a better informed decision about who they should choose. Despite the term ‘negative marketing’, it should never be about belittling others. Prospects in your target audience should ultimately see your negative marketing as beneficial to them above all else. The right sort of negative marketing not only makes your business seem the better option in-terms of products or services, but also makes you appear easier to relate to and more understanding of your prospect’s concerns. Negative marketing can be a very useful tool when it comes to distinguishing yourself from your competitors and highlighting your unique selling points. However, keep it respectful, keep it accurate and make sure it’s there to help prospects make a decision instead of looking like it’s part of a marketing feud between two competitors. It’s a powerful tool, but it can backfire and damage your business if it’s used incorrectly with the wrong statements or tonality. Want to write your own successful sales copy which persuades more people to choose your business? You MUST have the right answers to these questions for any hope of success. Read on to find out more. Writing copy can get confusing pretty fast. There are so many different copywriting techniques to utilise, so many different ways of describing things and so many different angles you can target. This becomes especially difficult when you’re a seller and need to view the copy from the mindset of a buyer to see if it will be effective. Banishing what you think about your product or service to try and imagine it from a cold prospect’s point of view can be surprisingly tricky, and it’s often one of the primary reasons business owners seek the help of copywriters – even if they’ve worked in their industry for many decades. If you’re doing your own copywriting, it’s imperative that you keep yourself in check throughout the writing process to avoid being led astray by different ideas. Providing you at least stick to the fundamentals of copywriting, you should end up with some copy which works reasonably well for you. If you’re a DIY copywriter, I’ve compiled a checklist of questions to ask yourself as you write your copy. By really thinking through these questions and applying them to your copy as you write, you can keep yourself in check and ensure that fundamental copywriting principles are in place which cater to the mindset of your target prospects and help them realise why they should buy from you. 1). Will your headline grab the attention of your target audience? 2). Does your copy get to the point and explain what the product or service is within the first few sentences (even on a basic level)? 3). Does your copy contain specific reasons to buy your product or service which are relevant to your target audience? 4). Does your copy mention the results and benefits of using your product or service? 5). How much does your target audience know about your product or service before they view your copy? 6). Does your copy explain everything a reader needs to know to make their decision (based on the information they are already likely to know from question 5)? 7). Does your copy talk about the visitor more than you or your own business (less ‘we’, more ‘you’)? 8). Does your copy explain exactly how your product or service works so the prospect knows exactly what they will be buying? 9). If you have any testimonials, awards or beneficial statistics, are they included to back up your selling statements? 10). Have you used sub-headlines to break your copy up into more digestible chunks? 11). If your answer to question 10 is ‘yes’, are these sub-headlines attention grabbing, relevant to the next section of copy and designed to keep the reader interested? 12). Based on your experience, what are the most common questions potential customers ask you about your business, product or service? Are answers to these questions included? 13). Does your copy have a call-to-action at the end with an incentive to contact you and suitable contact details? 14). Do all of the words you’ve used in your copy have a purpose? Are they there for a reason? Is there anything you could remove to trim the copy down without influencing its effectiveness? 15). If the copy is going online and needs SEO, have you included your target keywords throughout the copy and in the headlines with suitable <h1> and <h2> headline tags being used? Copywriting as a subject is huge, with thousands of different strategies and techniques to make words used in selling more persuasive. However, if you apply these questions when writing your own copy, you should end up with a piece which covers most fundamental copywriting principles and helps to make your target audience realise why they should buy what you’re selling. Here’s a simple but important tip to help you increase the sales conversion rate of your website or marketing material. Firstly, a key point to remember when it comes to buying and selling is that people buy VALUE. The more valuable something is to them personally, the more likely they are to buy it. After all, value is defined as “the importance, worth, or usefulness of something”, so a copywriter’s job is to make your product, service or business appear more valuable to your target audience. By firstly creating that logical and emotive urge to buy what you’re selling, prospects will look at the price much more favourably when it’s finally revealed. This is compared to putting the price first, where prospects know how much something costs well before you’ve built any value and even explained why they should buy it! Doing that doesn’t make much sense, does it? In fact, putting prices first can put prospects off and may mean that they don’t even read your copy at all. It can be conversion rate suicide if you sell high-value products or services with an emphasis on quality over cost. It’s one of the oldest yet most effective sales techniques in the book. Build a relationship, build that value, make them realise how useful your product or service would be and THEN tell them how much it is when they’re in the prime mindset to buy. You must time it well! The only exception is in highly price-driven markets, or when your prices are so low that they actually become selling points of their own. If you can undercut your competitors, display this selling point in all its glory near the top and in the main headlines. However, that aside, building value and really selling your product or service should always come first. Want to use advertising to direct traffic to your website? Go ahead! It can work very well. However, a very useful tip is to make sure that you use the same style, same tone and same selling proposition in both your advertising and on your website. Because your advertising is attracting potential customers who have clearly responded well to the type of copy used in the advert. This means that they’re far more likely to respond well to your website copy and convert into clients or customers if there’s a continuation of the same selling angle used in both your advertising and website copy. One piece which might resonate well with one potential customer may not work so well with another, so by using two different types and coming from two different selling angles, there’s a possibility that you could have advertising copy which works well to attract potential customers to your site, but website copy which then struggles to convert some of these visitors into actual clients or customers. As there are hundreds of different ways of describing a product or service and its benefits, it’s quite easy to focus on one selling angle within an advert, but then focus on a different selling angle within the website copy, with no guarantee that a prospect will find both equally appealing. For this reason, choose the selling angle and benefits you believe will work the best, and then stick to them throughout every stage of the marketing and sales pipeline – from advertising, to your website, to sales closure. Want to know how to use social networking for business? Here are 21 of my essential top tips if you want to use social networking for business and social bookmarking for business. Use these correctly and you can harness the power of platforms like Twitter, Facebook, Google+ and the vast array of social bookmarking websites to drive exposure, high quality traffic and sales. You need to provide information through your social networking and social bookmarking platforms which answers questions people in your target audience want to know. If you spot a few people on forums and social websites seeking advice on a particular topic, then you can expect many other people to be curious as well, so produce an article or piece of advice to cater to these needs before sending it out to the social world. A huge chunk of success in using social media for marketing is to choose the right topics and find the right niche areas, so never neglect good research! If a social media website is the canvas, and the content you promote is the paint, then only real works of art will receive the most exposure! No social networking campaigns will work unless you offer valuable and interesting content which is going to get read, shared and genuinely appreciated. The more effort you invest into this area, the bigger the reward. You can never give too much free advice and interesting information to your social networking bubble. The more you offer, the more likely you are to receive higher levels of business exposure. Any effort you put into social bookmarking and social networking will grind to a halt if you start sending out entirely commercial material. Not only is it against the rules of many of these platforms, but followers and readers will lose interest if you’re just trying to push what you’re selling all the time. Instead, take the soft sell approach and introduce your products and services in a subtle manner whilst putting valuable content first. When you have zero connections, the first thought is to seek out family and friends to build those initial numbers. This is all well and good to some degree, but many people become too obsessed with hunting for people and asking them to join instead of simply letting the nature of social bookmarking and social networking take its course. Besides, if you have to essentially beg people to follow or subscribe to you, then they’re unlikely to want to buy what you’re selling anyway, so that extra digit in your follow/subscription count is a rather meaningless one. There are a LOT of social networking, social media and social bookmarking websites out there, and many of them draw in large levels of traffic. It can look like a formidable task to not only sign up to 10-20 social websites, but also use all of them every time you want to share some new content. However, this initial investment is well worth it for years of future use. The same goes for your content too. Spending many hours writing a valuable piece may not provide any return for days or even weeks, but it’s those willing to invest in such a manner who will reap the greatest rewards. Tools like Social Marker and OnlyWire provide all-in-one social bookmarking submission services to take a lot of effort out of submitting new articles and news stories one-by-one. Submitting news stories and articles to social networking and social bookmarking websites is a simple yet laborious task. By setting up a rigid system, any marketing or admin related member of staff can carry out this job, keep your social media networking up to date and leave you to focus on more important duties. Simple pieces of code and many WordPress blog plugins allow you to add social media sharing buttons to your website and blog. This makes it very easy for readers to share your article or page on their favorite social networking or bookmarking platform. You may end up with as many as 10-20 small buttons next to every article, but at least it covers every option your visitors may have. Some people spend so long trying to make their social networking and social bookmarking campaigns work that they actually neglect more direct forms of marketing. Eventually it can become more about gaining followers than gaining actual clients. Keeping perspective is key, so if you’re putting weeks of work into your social networking without any measurable improvement in sales, make sure you re-evaluate your approach to avoid wasting time and resources. If one particular social networking or social media website is giving you more traffic than the rest, then focus more of your resources on that site. If another social site is lacking, then try and optimise it to boost exposure or even avoid using it completely if it’s taking up resources without any return. Not all such platforms are equal. Contrary to what some people might tell you, this form of marketing will not work for every type of business, or more specifically, the return on investment will not be a positive one. It’s always wise to test every possible avenue for selling opportunities, but stay alert to the possibility of sinking resources into this marketing method without any worthwhile return. Social networking and social bookmarking won’t work for everyone! When you use social bookmarking and social media websites, the amount of attention you receive is often dictated by the headline or first few words of what you have to say. By making it a statement which generates curiosity and interest, you’re likely to get more clicks, more readership and thus more exposure. If you have people taking an interest in what you have to say, then corresponding with them is key to building potential business relationships. Be sure to get involved in discussions, debates and opinion pieces. After all, it is called social networking! Social bookmarking and social networking websites will often act as a point of interaction with potential customers, so it’s important to make sure that the right personality and character is coming through in what you say. Some potential customers or clients may even choose to use you just because you appear more down-to-earth and approachable in what you say. Plus, the right sort of style and tone can really help you stand out ahead of your competitors. Articles, comments and posts throughout social media websites can attract the attention of search engines, so if you want the right people to find what you have to say, then pay careful attention to the keywords they are likely to search for. Keep up to speed with the latest news stories and use them as a marketing angle when you’re communicating through social networking platforms. Some ‘out-of-the-box’ ideas can even become viral on Twitter and other websites to generate massive exposure. When you’re on social networking and social bookmarking websites, be sure to explore other businesses and other contacts in your industry. You can then find out who they connect with and use this to build your own connections with relevant people. You don’t have to write EVERY news story, article and piece of advice. Your social media profiles could get masses of exposure even if you share another author’s content which goes viral. Remember, you’re relying on other people to spread and share your own content, so be a part of the ecosystem and share items you find interesting with your own followers and connections. If you’re finding good discussions and networking opportunities hard to come by, then create some yourself! Asking people within your social networking circle relevant questions can spark debates and discussions which spread across an entire web of connections and help you to network with more people. Every time you provide advice and credible statements to potential customers and others in your industry, you build up your own authority and help yourself appear as an expert in your field. This can be of great benefit when convincing potential clients that you’re the right person for the job. Want copy which helps you generate more sales? Learn more about Scott Chapman; Copywriter. When I speak to a lot of business owners who have run failed advertising campaigns, they blame the actual location or type of advertising the vast majority of the time. For example, if it was an advert in a magazine which failed to bring in many orders, they would either blame that specific publication or even denounce magazine advertising as a whole. No matter how good your product or service is, and no matter how much exposure your advert has in front of its target audience, the sales conversion rate can be near ZERO if the content is poor enough. Placing an advert in the right place, regardless of content and copy quality, is no guarantee that it’s going to work to any degree. 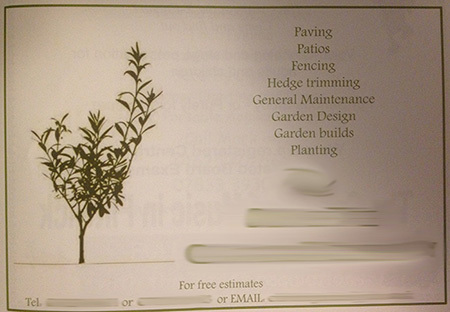 This is an advert I found in a business brochure. I’ve removed the business name and contact details. 1). No headline. There’s nothing there to grab the attention of their target audience. The only element vaguely resembling a headline (the blurred text) is their business name. 2). No actual selling! There’s no attempt made to explain why readers should use their service or why this company is better than their competitors offering similar services. 3). No credibility. There is no mention of what the company is about, who is behind it or anything which would fortify selling points with statements of credibility to build trust. 4). No building of a relationship. When personality and character is injected into sales copy, it helps readers to connect with a business and feel like there’s a real person behind the advert. With no actual sales copy here, it’s a bit difficult to achieve that! 5). No call to action. There’s no real attempt to persuade the reader to get in touch. Considering that the value of some of these services could be worth hundreds or thousands of pounds, attempting to persuade anyone to trust this business with such important tasks would be extremely difficult to achieve with such an advert. As well as missing out on any sort of selling impact, readers will pick up on the lack of effort (even if it’s on a sub-conscious level) and start to become suspicious of how much quality this business would put into their services if their advert is lacking in effort to such a degree. This means that as well as prospects being left in a ‘neutral’ mindset by the lack of selling, some of them might actually be put off altogether! No matter how good your product or service is, having an advert in the right place alone is no guarantee that it’s going to work. I’ve seen plenty of adverts in my time working with businesses, and whilst some of them have managed a response rate as high as 5-10%, others have only managed a response of 0.01% or even zero. As well as looking into the type of advert, the location of the advert and the quality of the design, just as much importance should be placed on the content and value proposition. After all, it’s what you say in the advert which is actually going to sell your products or services.